Drone events, expos and museum days are being ever more commonplace. Events like the recent Drone Day at the New Jersey Liberty Science Center. Liberty Science Center visitors got see things from a bird’s-eye view Sunday, while keeping their feet firmly planted on the ground. The experience was made possible by drones and special goggles that allowed users to look at things from the quadcopter’s point of view, zipping across the New York City skyline during the Summer Day of Drones. Deepesh Dhingra, senior exhibition leader at Liberty Science Center, said this was the seventh drone-centric event the museum has held, where it’s “drones all day, every day.” The event draws an additional 1,000 people to the center on weekends, when the average number of visitors is about 2,000, he said. The latest unmanned aerial vehicle exploded into the public marketplace several years ago and began flying off shelves, into the homes of novice users. But drones are not only fun, Dhingra said, they’re educational. And the Drone Expo 2017 at the Strategic Air Command and Aerospace Museum in Nebraska. The Strategic Air Command and Aerospace Museum in Ashland will hold a Drone Expo 2017 in September featuring multiple indoor and outdoor activities for aviation and drone enthusiasts. The expo will be from 10 a.m. to 2 p.m. Sept. 30 and will include an indoor drone drag race exhibition, flight safety presentations, booths from experts in drone and aviation related fields and a hands-on workshop for youth. The outdoor activities include a Drone Fun Fly and helicopter rides. Any guest bringing their drone (quadcopter, helicopter, or multirotor) can fly free in the museum’s outdoor obstacle course. This is great news for the commercial drone operator and hobby operator alike. These events are a great way to expose yourself to new drone technology and to participate in your local drone community. We support and participate in events like these, whenever we can, because we view ourselves as more than just a drone training school. 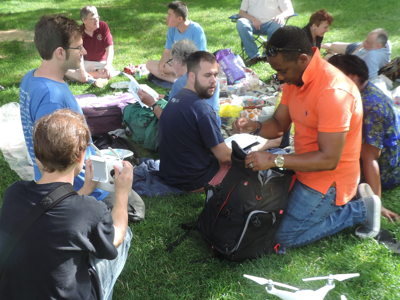 At Drone Universities, we consider ourselves a member of the drone community too.